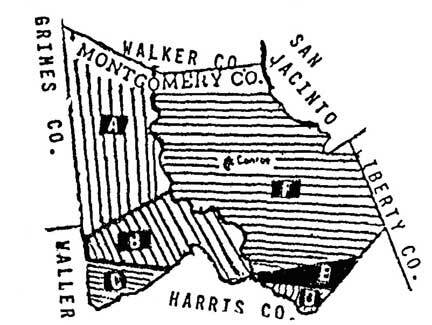 Montgomery County was the third county formed in 1837 while Texas was still a Republic. Counties created from Montgomery County are: Grimes, San Jacinto, Waller and Walker counties. Click on the graphic below for Montgomery County's Geographic History. sponsor a county, please contact Shirley Cullum. Montgomery County Texas Banner graphics were designed by and remain the property of Jean Huot Smoorenburg. You cannot use this banner without my written approval. Copyright © 1997 - 2019 by Jane Keppler. 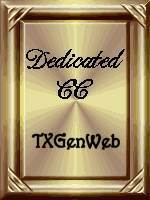 This information may be used by individuals for their own personal use, libraries and genealogical societies. Commercial use of this information is strictly prohibited without prior written permission from Jane Keppler. If material is copied, this copyright notice must appear with the information and please email me and let me know. Neither the Site Coordinators nor the volunteers assume any responsibility for the information or material given by the contributors or for errors of fact or judgment in material that is published at this website. If you are being charged to view/use any of this information or have questions or comments, please contact Jane Keppler.